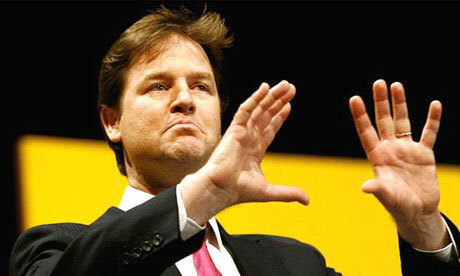 Deputy Prime Minister Nick Clegg has disputed the Institute of Fiscal Studies’ analysis, which found that government policies will hurt those on low incomes most (1). He claims tax cuts will lead to economic growth which will create jobs, increasing the incomes of the poorest as they are employed. This is wishful thinking. Even the most enthusiastic advocate of this theory would have to admit that in the past such policies have never ended mass unemployment, which rose under both Reagan and Thatcher. Even the government influenced Office for Budget Responsibility estimated over 600,000 public sector job losses by 2015, with 700,000 more made unemployed due to knock on unemployment in the private sector due to reduced demand (2) – (3). Clegg is claiming that unemployment will fall under a government which is going to be sacking hundreds of thousands of public sector employees, both directly and by cutting funding to local councils. This is combined with public sector pay freezes (effective pay cuts taking inflation into account) and benefit cuts, including changes in the way inflation is calculated for increases in benefits and pensions, so both will effectively rise more slowly than inflation and be cut in practice (4). Only full employment and everyone working for life could avoid benefit cuts and unfair taxes hurting the poorest (including the poorest pensioners). Neither Clegg nor his coalition partners have guaranteed that. There will be a lot more special pleading from Cameron, Osborne and Clegg on how the debt left to them by Labour makes these measures unavoidable if the debt's to be tackled. This lacks all credibility while they continue to provide unlimited funding to grossly over-priced ‘Private Finance Initiatives’ and ‘Public Private Partnerships’, keep pretending Britain can afford it's own nuclear deterrent and keep subsidising privatised rail companies (as well as BAE arms exports through arms credit export guarantees) ,just like the previous government. It would also be interesting to know how they can afford big cuts in corporation tax for all companies, including the biggest multinationals, if the public finances are in such a bad state that they're cutting benefits for the poorest (5). How is it that the poorest are once again being made to pay most in cuts, while taxes for the biggest companies are being cut? If the job cuts in the public sector do lead to knock on job losses in the private sector and another recession, the result will not have been to reduce the debt or increase tax revenues, but to increase it massively as tax revenues collapse in another recession. This is a scenario seen as a serious risk by most economists – and all the more likely because Angela Merkel’s government in Germany and Nicholas Sarkozy’s in France have adopted similar policies – and the rest of the EU is one of the largest markets for British exports. 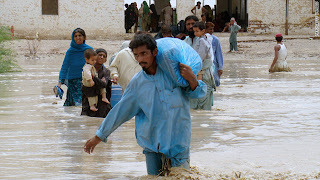 With tens of millions of people without food or clean water after the floods in Pakistan; and the UN urgently requesting more helicopters for the aid effort; NATO governments should declare an immediate unilateral ceasefire in Afghanistan and re-direct many of their military helicopters and supply trucks from the war to the relief effort (1) – (4). This could save large numbers of lives and win large numbers of hearts and minds which cannot be won by continuing the war, especially as the flood hit areas include some with large Pashtun populations, the same group which most Taliban on both sides of the Afghan-Pakistan border come from. If the Taliban agree to a ceasefire then some of the vast quantities of ammunition and fuel currently being shipped to Pakistan and then through passes into Afghanistan for NATO forces could be replaced by aid shipped and trucked to flood survivors, with the operation placed under the command of charities, not military commanders. Currently 5,000 truckloads a month of supplies are shipped to Pakistan then trucked through Pakistan and Afghanistan via the Khyber Pass to NATO forces there. Yet enough labourers and trucks have been hired to re-open routes that NATO spokespeople say “There’s no disruption that would influence any of our operations at that sort of level.”. (5) – (6). If the Taliban continue attacks on NATO forces during a ceasefire called to help other Afghans, Pashtuns and Muslims they will lose support as a result. I’m personally in favour of withdrawing from Afghanistan, but of course as long as we have troops in Afghanistan we have a duty to keep them supplied with enough food, ammunition, fuel and transport to avoid un-necessary casualties – so the aid redirected could not include the use of all the helicopters in Afghanistan or the redirection of all supply trucks to carry aid instead. However if all military offensives were suspended by a ceasefire the troops would require far less supplies for purely defensive operations. The message sent by helicopters and supply trucks being sent to save Muslims would have an immense impact on the view of NATO governments held by ordinary Afghans, Pakistanis and Muslims worldwide; just as many flood survivors have been turned towards Islamic fundamentalist groups by receiving aid from them. More importantly it could save huge numbers of lives. It could also help build trust for a peace agreement which will have to come sooner or later in a war in which US intelligence reports show 90% of the people fighting NATO are neither Taliban nor Muslim fundamentalists (7). The war in Afghanistan has been extended to Pakistan by the Obama administration on a much greater scale than under Bush, with more unmanned drone strikes (causing many civilian casualties), more US military aid to the Pakistan military dependent on them fighting the Pakistan Taliban and more US Special Forces leading Pakistan ‘counter terrorism’ units as they, for instance, round up suspected Taliban, torture them and shoot them in the head. Dozens of tortured bodies were found in the town of Swat for instance, after a US led offensive by the Pakistan military. Later a bomb set there killed 3 US special forces trainers. Swat is one of the areas hit by flooding. (8) – (13). The Taliban on both sides of the border have committed plenty of murders of their own, including murdering a woman who made her living by dancing and stoning women accused of adultery to death. This does not make torture and summary execution without trial of anyone suspected of being a Taliban, without any trial, somehow better though, especially since it will result in the torture and murder of many people who turn out to be innocent. So far some victims of the floods say they have had more help from Islamic political parties like that of former Prime Minister Nawaz Sharif and from more extreme groups linked to the Pakistan Taliban than they have from their own government or foreign governments (though some have actually welcomed any help, including from US forces). If this continues it will both cost a lot of civilian lives – far more than terrorism – and win a lot of hearts and minds – for the Taliban and similar extremists (14). If NATO continues to use helicopters, ships and trucks which could be helping flood victims to send more fuel and ammunition to fight a war in Afghanistan while millions of Pakistanis starve or die of waterborne diseases due to lack of clean water though, the message to them will be clear : that NATO governments don’t really care about saving their lives, nor about winning their hearts of minds by any means except force or the threat of it. This will be especially so as the trucks bringing supplies to NATO troops in Pakistan via the passes on the border in North-West Pakistan will be passing through flood hit areas on their way. Currently the US military have provided 19 helicopters out of at least 225 that they have based in Afghanistan and have rescued thousands of people from drowning (15) – (18). (They have far more helicopters than this in total worldwide but the majority are being repaired and maintained at any one time. The British military, much smaller, has 500, though most aren’t suitable to carry troops and many have to be repaired and refitted at any one time (19)). This is great to hear and has saved thousands from drowning, but a pretty small contribution for the second largest economy in the world and the only superpower, particularly compared to the hundreds left devoted to the war in Afghanistan. NATO also promised to send ships and planes with aid. So far that seems to have amounted to just three planeloads from the whole of NATO (much of it from Slovakia, one of the poorest and smallest countries in NATO) and one US navy ship carrying 1,000 marines. Again this aid is welcome and important and saving lives, but compared to the resources devoted to killing people in Afghanistan, it’s very small stuff, especially coming from an organisation which includes the largest military in the world and two of its wealthiest economies – the EU and US – not forgetting Canada (20) – (23). NATO’s website boasts of having “transported more than 421,000 pounds of emergency supplies”, with pounds presumably chosen as the unit of measurement because if you translate that to tonnes it comes out at just 186 tonnes – a small fraction of the amount supplied to NATO troops in Afghanistan over the same period (24). By 25th August the UN said it had just 13 helicopters for the flood rescue effort – and for the supply of food and clean water to refugees on a scale that dwarfs the rescue effort (25). It’s not much good rescuing people from drowning if you then let them and a thousand times as many others die of hunger, exposure or water borne disease. The US’s defence budget for the financial year 2010-2011 is $637 billion (a billion being a thousand million here). Spending on the Iraq and Afghanistan wars since 2001 already exceeds $1 trillion (i.e 1 million million dollars).US government spending on the war on Afghanistan for the same period is estimated to come out at around $41 billion (41 thousand million). It’s pledge for aid to Pakistan flood victims stands at 150 million, which, while it’s the most pledged by any government so far, works out at less than 0.4% of it’s budget for the Afghanistan war this year. Even if you compare total US aid to Pakistan each year, at $7.5 billion over 5 years, or $1.5 billion a year, it comes to under 4% of spending on the war on Afghanistan per year, despite education and employment being far more effective ways to reduce terrorism and the overlap of sectarian violence with crime (26) – (27). British government priorities don’t seem to be much better – one helicopter for instance being used to carry British Prime Minister David Cameron about on a public relations and vote getting exercise – and another used to let Deputy PM Nick Clegg do the same a few days later. Apparently this use of a helicopter was more important than either transporting troops in Afghanistan or saving drowning or hungry or ill people in Pakistan. The main debate in the media was over whether security against the Taliban shooting Cameron’s helicopter down was good enough or not (28) – (29). Far more money and effort is being invested in getting ammunition and fuel to NATO forces to continue the war than to save any civilian lives in Afghanistan. This is exactly how you lose a war for the hearts and minds of the majority of the population. (6) = New York Times24 Aug 2010 ‘Pakistan Flooding Disrupts Afghan War Supplies’,http://www.nytimes.com/2010/08/25/world/asia/25pstan.html ; ‘Capt. Kevin Aandahl, a spokesman for United States Transportation Command, which oversees logistics for the war, said that the flooding had slowed supply lines but had not stopped matériel from getting to American troops in Afghanistan. ...“The bottom line is that stuff is moving,” Captain Aandahl said. He said he did not know the extent of the slowdown, but that goods were still crossing from Pakistan into Afghanistan via the two main border crossings. Baghdad in Iraq - a land of opportunity? and if so, for who? John Rentoul has risen to new heights of absurdity in his attempts to present the Iraq war as a success, by using a comment article in The Times newspaper by Jeffrey Archer as a source for a claim that Iraq is now a wonderful place to live with a vibrant economy. Archer was found guilty of perjury (i.e lying to a court) and of obstructing the course of justice – and jailed for it, while Blair got off with lying to an entire country by being Prime Minister (1) – (2). Rentoul’s blog post has the heading “Iraq – Land of Opportunity” while Archer’s comment article is headed “wake up you Brits, make a fortune in Iraq’ and claims that Baghdad is now “a boom town, not a bomb site” on the basis that there are now “few suicide bombings” , although he admits “the most recent exploded the day after I left”. One commenter on Rentoul’s blog quipped “don’t tell me, it goes boom, boom, boom”. Unfortunately that joke isn’t too far from the truth. The number of sectarian killings, car bombings and suicide bombings have certainly fallen compared to say 2005 or 2006, but they continue and remain much worse than they were in the 90s or 2001-2002 – and so a long, long way from a vindication of the decision to invade Iraq. Members of the Awakening militias, who were persuaded to fight for the government when the American government was supplying their wages, have begun to be recruited to fight for Al Qa’ida, which is now offering higher wages, something made easier by the US government ending funding of the militias’ wages last year (3) – (4). The US and EU governments have either been blinded to the connection between unemployment and poverty and sectarian killings, due to their adherence to the theory that the free market creates democracy – or else have failed to care about the connection. In Iraq and Afghanistan (as in the former Yugoslavia crime in the 1990s) crime is now the only employment that offers the chance to make enough to feed families for large numbers of people. Sectarianism provides a justification for this war economy. If Sunnis and Shia are painted as enemies who threaten each other then a Sunni killing a shia and taking his money can claim to be defending his own people rather than committing a crime against another Iraqi. 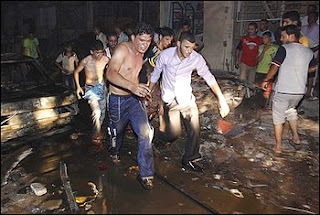 Similarly one community can drive another out of their homes and take them for themselves and call it ‘self-defence’ or warfare; or Shia kidnappers can take a Sunni hostage, get a ransom and then kill them anyway to eliminate the risk of being identified, trying to justify it in terms of sectarian warfare (5) – (6). The murder of Christian aid workers in Afghanistan, which some Taliban claimed responsibility for, while others denounced it, is another example of religion, ethnicity and ideology being used to justify theft and murder in a country where surviving any other way has become impossible for many of it’s people. The murderers were almost certainly ‘thieves’ as the Afghan police say they are, while also seeing themselves as Taliban, even if many Taliban leaders disown them. The theory that the aid workers were trying to convert Muslims to Christianity is the excuse the bandits need to claim to be defending their people rather than just murdering defenceless people. Similar things happened with splinter groups from Al Sadr’s Madhi army in Iraq (7). Lord Archer is probably right that there’s plenty of money to be made in Iraq too. That doesn’t mean the majority of Iraqis are benefiting though. There was plenty to be made for foreign companies, businessmen and contractors even at the height of the insurgency and occupation, both from Iraqi oil revenues and from the Coalition Provisional Authority’s generosity with Iraqi money. Under Bush’s ‘Governor of Iraq’ Paul Bremer, described by UN envoy to Iraq Lakhdar Brahimi as “the new dictator of Iraq” over $8 billion of Iraqi money was handed out to various private contractors working for the “Coalition Provisional Authority”. Much of it has never been accounted for (8) – (13). When challenged about it by congress Bremer simply replied that it was Iraqi money, not American taxpayers’ money (the clear implication being that he could get off with handing it out to whoever he liked as the US congress couldn’t hold him to account for it – and with 50,000 US troops remaining in Iraq until December 2011 the Iraqi government can't either) (9). A recent report ‘by the US Special Investigator for Iraq Reconstruction says $8.7bn (£5.6bn) out of $9.1bn withdrawn between 2004 and 2007 from a special account set up by the UN Security Council is unaccounted for.’ (13). This was money from the UN’s Oil for Food programme for Iraq. Bremer shouldn’t have been distributing a penny of it without the approval of a new Iraqi government. Many Americans may be unaware of this aspect of fraud relating to the programme, as their media mostly focused on millions of dollars allegedly pocketed by some UN Officials rather than the billions vanished by Bremer’s CPA. As far as can be determined none of the money Bremer disappeared went to Iraqis for food. Meanwhile more Iraqis remain shorter of food, clean water, sewerage and electricity than under Saddam and sanctions. In Iraq IMF policies imposed as conditions for debt reduction have included cuts in food price subsidies and provision of food rations to the poorest. By autumn 2007 more people relied on government rations for food than under Saddam and UN sanctions – and the amount and types of food provided to each person were reduced compared to the 1990s (14) – (15). Hundreds of people in Baghdad were scavenging in bins for food (16). Yet in December 2007 the Iraqi government cut food rations again on the stated grounds that the budget (much larger than under Saddam and sanctions in the 90s) couldn’t pay for them (17). 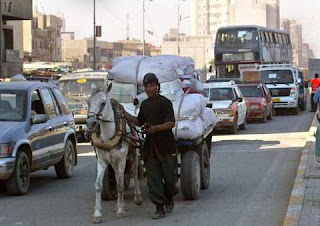 In theory the rations were to be replaced by cash payments of social security – but with rocketing food prices and Iraqi and US government corruption this has never been implemented and would be unlikely to allow Iraqis to afford enough food to eat (18) – (19). 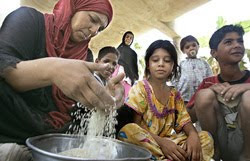 In April 2010 the Iraqi government cut the range of foodstuffs in the rations by half again, citing food price rises and budgetary problems (again) as the cause (20). Many refugees inside Iraq – ‘internally displaced people’ forced out of their homes by coalition offensives and sectarian killings by other Iraqis – can’t get food rations at all as they are no longer at the address they were listed at for rations but in tents elsewhere (21) – (22). The number of Iraqis unable to afford enough food is still on the increase and around a fifth of Iraqis are unemployed and the same proportion live below the poverty line (23). Halliburton and it’s subsidiaries also made big profits by over-charging the US military in Iraq for oil and food among other things, in many cases in no-bid contracts (24) – (25). In this case the money was being stolen from American taxpayers, rather than Iraqis – but when it came to money for shoring up the levees in New Orleans to prevent the flooding or to helping the survivors after hurricane Katrina, private mercenary companies like Blackwater once again got far more money than people who were really in need. The theory that the invasion was protecting Iraqis from Saddam using chemical weapons on them, as he did against the Kurds in the 80s, has also been revealed as empty propaganda. When Saddam was gassing the Kurds the US and British governments were funding and arming him. Twenty years later they claimed they were going to prevent Saddam ever using WMD on his own people again. Unfortunately Coalition forces during the occupation used both cluster bombs (which kill as many civilians as land mines) and chemical weapons such as white phosphorus and depleted uranium shells in the middle of towns and cities. In Fallujah, which suffered major coalition offensives on it in April and November 2004, there are now extremely high levels of cancers and birth defects among children; though clusters of leukaemia and birth defects were already high in many areas since DU was used extensively by coalition forces in the 1991 war (26) – (28). I posted a shorter version of this post as a comment on Rentoul’s blog, but he moderated it out of existence (though it’s possible this could have been due to fears of legal action from Lord Archer). It seems that reality is still not merely a foreign country but an alien planet or universe for those who have blind faith in the Iraq war and Saint Anthony. If Blair and his supporters were willing to apologise for peddling deliberate distortions of intelligence analyses to start a war that was bound to kill far more people than it could possibly save – and if they weren’t pushing for another war, that might be old news. Unfortunately since Blair left office he has continued to call for “action” to avert the “threat” from Iran ,for instance in speeches in the US and at his appearance at the Chilcot Inquiry. Blair and his propaganda remain far from the truth and potentially dangerous. I genuinely believe that Blair genuinely believes what he says, but that doesn’t make it the truth. In fact Blair has probably bought his own propaganda line because it’s preferable to the truth, which is that he created a disaster which is still killing people. So there’s no option but to keep on repeating the facts about the continuing disaster in Iraq in the hope that it’ll stop it being repeated in Iran. NATO governments have tried to persuade themselves and us that their “mission” in Afghanistan is a benevolent project of “Nation Building” in which they prevent terrorists having a safe base and provide Afghans with “security” and protection against a new Taliban government. Neo-conservatives have also compared the invasions and occupations in Afghanistan and Iraq to the overthrow of the Nazis and of the militaristic regime in Japan, both of which were replaced with democracies. The trouble is that the post World-War Two occupations of Japan and Germany were not nation building at all, because Japan and Germany had both been single states for decades with people who all saw themselves as German (for decades) and Japanese (for centuries). So the nations involved had actually been built long before World War Two even began, in some very bloody wars. There is no existing nation which most Afghans identify with as the group they primarily belong to. Most Afghans do not see themselves as Afghan first, nor even Pashtun, Hazara, or Tajik. They identify with their own tribe in it’s own valley. This may well not be a sign of backwardness either, but a sign that the central government has never done much for people outside the main cities other than make war on them to try to get them to submit – and send police and soldiers many of whom abuse their power by stealing and worse. US intelligence analysts say that the main enemy in Afghanistan is not the Taliban. The majority of people NATO forces are fighting are not motivated by religious fundamentalism, but are just local Afghans resisting the invasion of their territory by troops from elsewhere according to these intelligence reports (1). Recently leaked NATO documents include a revealing interview by NATO officers of a former Taliban fighter, who told them they he had been timber merchants who had first joined the Taliban after being held without trial or explanation by NATO forces. He also said a senior Taliban commander first joined after NATO destroyed his house (2). Matthew Hoh, a former US marine who served in Iraq as a Captain and also worked as a civilian contractor for the Pentagon in Iraq and in the US embassy in Afghanistan during the current war there, says he initially believed it wasn’t Jihadim but nationalism that motivated most of those fighting the US in Afghanistan. He says he later realised it wasn’t nationalism, but what he calls “valley-ism”. He found that in most of Afghanistan people see themselves as part of the people living in the valley they live in, not any larger group or country. So the problem went beyond sending foreigners into Afghanistan or Hazara or Tajik Afghan troops into Pashtun areas of Afghanistan. Any armed force not from the same valley is seen as an outside invasion which must be resisted according to tribal codes, just as Iraqis resisted invasion of Iraq as their country and just as Americans would resist any invasion of their country by foreign forces (3) – (4). Other driving forces behind people joining those fighting NATO and Afghan government forces include killings of civilians by those forces. For instance a report by the US National Bureau of Economic Research found a strong link between civilian casualties caused by NATO forces in Afghanistan and the number of insurgent attacks on NATO forces in the areas where the casualties had been caused in the six weeks after them (5) – (6). This shows that in Afghanistan as in other countries in the past actual nation building is not just a process of democratisation or rebuilding economy, state and society, like that in Germany, Japan or even Iraq. It has not been everyone coming together as equals as in Rosseau’s imagined “social contract”. In every country it has been a process in which one group forces others to submit to them by force in bloody and oppressive campaigns of war and massacre, as English Kings, Queens and soldiers did in Scotland, Wales and Ireland over centuries to form the ‘United Kingdom of Great Britain’ and French kings did in the Albigensian Crusade in southern France and in campaigns of subjugation in Flanders, Brittany, Aquitaine, Brabant, Burgundy; as well as against the Hugenot Protestant rebels. The same happened in Germany, which was only unified by a series of wars and getting small principalities so indebted to Prussia that it could buy them over under Chancellor Otto Von Bismarck in the 19th century. In Japan there were centuries of bloody warfare over who would be ‘Shogun’ of the whole of Japan (after the previous inhabitants, the ‘Ainu’ had been largely wiped out). The same happened in the US as European colonists attacked and massacred Indian tribes across America – and then Northern forces did much the same to Southerners in the American Civil War (which, despite being dressed up as being about “liberation” for black slaves in the South was accompanied by lynchings of black people in Northern cities when it was announced black soldiers would be recruited, segregation of military units by race and continuing lynchings and ‘Jim Crow’ segregation laws in North and South long after the war was over. After this process is over then the state indoctrinates generations of children from birth to think of themselves as all “British” or “American” or “Iraqi” and to think of their country as uniquely tolerant, progressive, benevolent and good. This indoctrination is generally quite successful. I am not arguing that other nationalisms which call for separation from the then established state are necessarily more progressive or less brutal – the wars in the former Yugoslavia showed that every nationalism involved was harmful. I am pointing out that actual nation building in every country in history has not been a benevolent process in which the majority were peacefully persuaded to become part of the state, but one of oppression and force in which those with more power and wealth imposed their will on others to gain even more power and wealth. There have often been some in the countries being absorbed by force who were in favour of the union – but usually just as many opposed to it and whose acquiescence was only gained by being attacked, fought, having many of their civilians massacred and their lands and property taken. It would be nice to think that the war in Afghanistan was a unique case, but it’s not. The Karzai government and its police and military are as corrupt and brutal as all the other factions in Afghanistan. 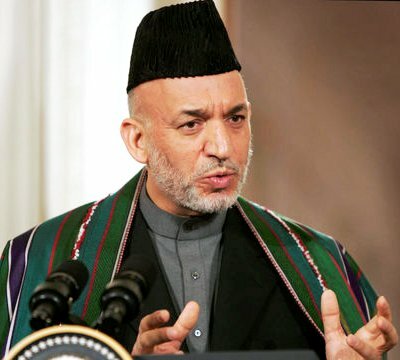 Helping impose a strong central government’s authority across Afghanistan, if continued, will continue to be a process of creating new enemies by invading the territories of local tribes with forces from other tribes, other identity groups (Hazaras, Tajiks and others invading lands populated by Pashtuns) and foreigners invading Afghanistan and killing people who resist the invasion. It will continue to involve accidental killings and deliberate massacre of civilians, jail without trial on mere suspicion and torture, creating new enemies or “insurgents” in a process that could go on for decades. We can try and persuade ourselves this is a benevolent process on the grounds that our government and military are surely basically good (when in fact they’re no better or worse than most others) ; and on the grounds that we are giving them the unity and peace we have (forgetting that centuries of war, oppression and massacre actually created unity by force – with the apparently “natural” unity which came after it only being achieved by a subtle life-long process of indoctrination over generations). By invading the lands of Afghan tribes and killing them if they try to resist the invasion we are not promoting democracy, but it’s opposite. Once a relationship between government and people based on the people obeying or being killed is established it will take decades or centuries to reverse and democratise. Democracy as a system of government only survives as long as people believe in it. That means it can only be promoted by persuasion and example. As soon as you try to force people to obey a central government who don’t recognise it as being their government at all – and do so by killing any who resist – you de-legitimise democracy and make it seem like hypocrisy. This will not make Afghans more moderate in their religion or nationalism any more than September 11th made most Americans more moderate in their views on foreign policy. In both cases it makes the majority more extreme, because they are suffering extreme pain, mourning, anger and the desire for revenge. If Afghans in the outlying regions of Afghanistan are to be persuaded to accept the authority of a central government then they should be persuaded by that government aiding them with infrastructure projects – clean water supplies, electricity, healthcare, education etc. Sending troops in instead not only won’t work, it’s backfired spectacularly. Militarising aid and reconstruction projects has similarly back-fired according to many charities operating in Afghanistan, resulting in the Taliban and other insurgents seeing them as part of the occupying forces rather than as people bringing assistance with no strings attached. Despite much propaganda by certain governments most aid agencies said they had no problem in operating in Afghanistan under the Taliban. It can’t be denied that most Afghans do not want the Taliban back in power in Kabul – and that Pakistan’s military and military intelligence have continued backing the Taliban so they can exclude Indian influence from Afghanistan and have “strategic depth” for guerrilla campaigns if India invades Pakistan. That is unlikely to change once NATO forces leave Afghanistan. Pakistan’s military will try to get a Taliban government back in Kabul, as they did using military aid and tacit support from the US government in the 90s, also aided by Saudi money. Our governments could however end all military aid and arms sales to Pakistan so that it can’t continue to pass these on to Taliban forces in Afghanistan, reducing Pakistan’s ability to fund the Taliban and forcing the Taliban to negotiate a coalition government deal with other Afghan factions – and they could increase funding for civilian infrastructure and aid projects in Afghanistan as a viable way for the Afghan central government to gain the support of people across Afghanistan. That could achieve what no “nation building” war ever will at a fraction of the cost in money and lives. On NATO and ISAF figures NATO forces have killed a lower proportion of those civilians killed than Taliban forces have, though NATO’s own figures can’t be taken as particularly neutral or unbiased. Investigations by Human Rights Watch, the Afghan government and others have found that US military investigations of incidents in which US forces have killed civilians in Afghanistan have repeatedly been “seriously flawed” and deliberately hidden the true numbers of civilian deaths. The US military reports on the Azizabad airstrikes in 2008 and on the Farah airstrikes in May 2009 were equally farcical distortions of the truth, despite the latter having taken place under Obama’s new strategy. Kunduz in September 2009 was the first instance of NATO admitting to causing civilian deaths in a major incident – though this may have been because German forces were responsible, allowing McChrystal to admit it without upsetting his own troops or US public opinion – and as airst Recent leaks revealing civilian casualty incidents covered up by NATO forces underline this. Experts also point out that all figures on civilian deaths, even those compiled by the UN, the Afghan government and the Afghan Independent Human Rights Commission (which is actually appointed by Afghan President Hamid Karzai) are likely to be far lower than the true figure due to these bodies lacking enough resources and people to investigate all civilian casualties across such a large and mountainous country, coupled with the dangers of kidnappings or becoming collateral damage (caused by both sides) making reporting in many areas almost impossible (3) - (4). Civilian deaths caused by NATO forces fell under McChrystal (on NATO figures) as a proportion of total civilian deaths, though the total number of civilian deaths has continued to rise for most of his period as supreme NATO commander for Afghanistan. General Petraeus, replacing McChrystal a few weeks ago, has also said he will review rules of engagement brought in by McChrystal which had required troops to definitely identify any target before firing on them. These rules are unpopular with the troops who see them as “too restrictive”, but the NBER report suggests they saved not only civilian lives but also those of NATO soldiers by reducing revenge attacks on them (5). It’s also worth noting that McChrystal and Petraeus strategy has involved a focus on “counter-insurgency” using Afghan forces led by American “advisers”, with the “trigger pullers” being Afghan. This suggests falls in statistics civilian casualties attributed to NATO forces may have been achieved by assigning many US-led night raid squads of Afghans as being carried out by “unknown” or “Afghan government” forces rather than NATO ones (6) – (17). This echoes the methods used in Iraq where native “special police commandoes” and other “counter-insurgency” units were trained by some of the same people who trained the notorious US-trained death and torture squads in El Salvador. Many Iraqis say members of their families have been tortured, summarily shot without explanation, or “disappeared” just as Salvadorans were by these US trained forces (18) – (19). Iraqis, like Afghans, will probably continue to suffer at the hands of these “counter terrorist” units given the 50,000 US troops that will be staying in Iraq as “advisers” despite the US “withdrawal”. Another motive for Afghans joining the insurgency is that they or their relatives, friends or neighbours have been tortured or held without trial or explanation by NATO or Afghan government forces. For instance an excerpt from the recently leaked NATO documents on Afghanistan published in the Times newspaper discusses an Afghan who wanted to defect from Taleban forces to government ones. When asked why he had joined the Taleban in the first place he replied that he had been a timber merchant and had been stopped at a NATO checkpoint and then held without explanation for 7 days. He added that one senior Taleban commander had first joined the Taleban after his house was destroyed by “coalition forces” (presumably meaning ISAF/NATO and Afghan government forces) (20).